Real life for me is constant chaos, which means our built-in cabinets held everything #mremporium and I didn’t know what do with. So this summer I asked my talented stylist and blogger daughter in law if she’d be interested in styling them for me! She has a great eye for scale, balance, and organization so I knew she was perfect for the project. Now I so happy with the way it looks and it makes me feel relaxed every day. Here is her blog post with a few tips to try in your home! I was thrilled when my mother in law asked me to style her bedroom built-ins for her. Actually, not gonna lie, she’s been begging me to do it since, like, January. I’m not sure why I didn’t hop on the opportunity sooner because it really was a dream come true getting to shop for her space. I mean, who wouldn’t love getting to walk into RE: and just make a pile of all of the pretty things to take home! Everything I used to style her shelves was from RE: so if you love anything you see, be sure to check out her store! Today I’d like to share a few things to keep in mind when styling built ins. Built ins are so versatile and fun but can be totally overwhelming if you’ve got no idea where to start. Hopefully, you’ll be able to take some tips away today and begin tackling those shelves you’ve been neglecting for some time. Books are really great fillers of space. 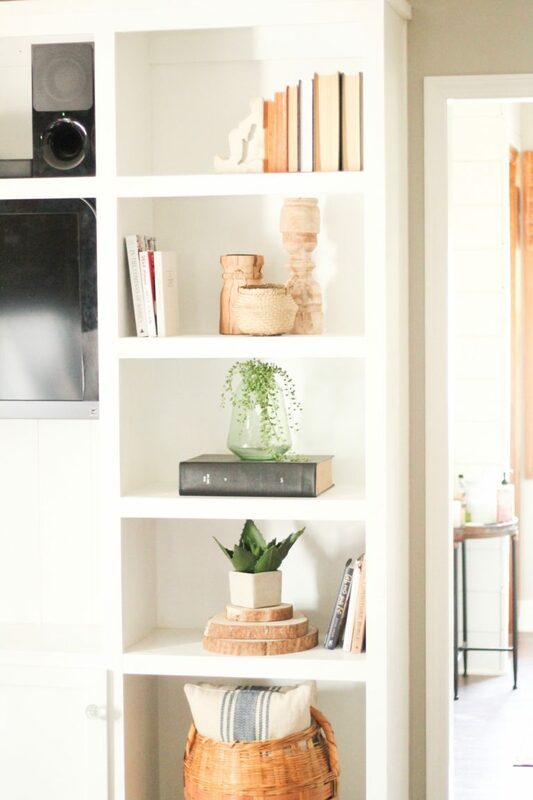 So if you’ve got a huge built in, books are a fantastic way to fill up some of the shelves without feeling like you really have to “style” too much. Find some chunky corbels to stick on the end and (decor tip) flip the books around so the spine is to the back of the bookshelf and you can see the pages for a fun effect of texture. You want to create a flow for the eye to follow so using books to make certain pieces higher than others is one way. I always love to incorporate wood elements, so for these built ins I used some tree trunk pieces to add height. Also when I was shopping, I looked for things like vases that were differing heights. Don’t be afraid to layer items either. Another way to create dimension for the space is to layer pieces in, around and behind. For example, I used the wood cutting board and the small tobacco basket. This is going to seem obvious, but don’t overdo it. I like to start with a clean slate and slowly add stuff in. Less is more. This means if I’m not loving something, I don’t use it and I wait for the perfect piece to use instead. I like to consider the rule of 3’s. Grouping decor pieces in threes on the shelf. It helps me remember to keep it simple. Just like I teach my students, no one gets it perfect the first time. Once I get a rough styling done I take a step back to look at it all together. I most definitely make changes to what I’ve done the first time around. Sometimes even two or three rounds of changes occur before it becomes “just right”. As I walked out I asked my mother in law what she thought about them. Her reply, “yes, they make me happy.” And THAT, my friends, is what it’s all about. Creating a space that brings you peace and happiness! I’m curious, what spaces are you working on to create peace in your home? Visit my blog and let me know!